One of the best things about getting hunting binoculars is that once you have such an item, it’s a lot easier for you to hunt. Let’s face it, accuracy is important when you go hunting, and with the right binoculars, you can make the entire hunting experience a lot better and more interesting, to say the least. It all comes down to figuring out the right approach and making the most out of this entire process. Here are some of the things to consider. 1. 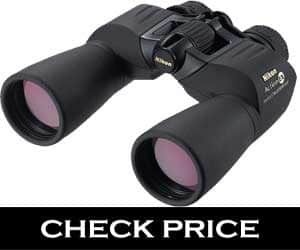 Bushnell Green Roof Trophy 10×42 Binocular – The Mid-Range Breaker! 2. Nikon 7245 Action 10×50 – The All-Terrain Extremist! 3. Redfield Rebel 10x42mm Binocular – See Ten Times Larger! 4. Bushnell Legend L-Series 10x42mm Binoculars – The Extreme Hunter’s Binoc! 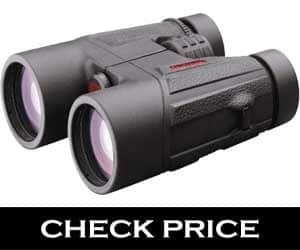 What to look when buying hunting binoculars under $200? When you get the best hunting binoculars under 200 dollars, your focus has to be on making the hunting experience better and cooler as a whole. Doing that is not going to be a walk in the park in most situations. You need to focus and you have to find some new ways to make this process cool and interesting. 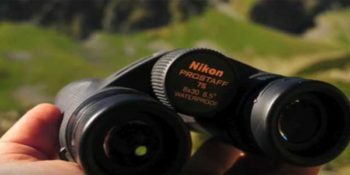 Of course, the best thing that you can do is to identify the right hunting binoculars based on what you can find on the market. Some of the pieces are super expensive, others less so. That’s why you always need to be on the lookout for high-quality units if you can. This way you can be sure that there will be no problems, and in the end, it will just be a fun and rewarding opportunity as well as a great experience. But yes, having the best binoculars will help you improve your hunting approach, it will even raise the confidence levels and it’s just a fun and cool moment for you to focus on. It’s interesting as it is rewarding, and in the end that will help a lot. You just need to test this out, give it a shot and in the end you will most likely appreciate the great value and quality. With large diameter lenses, the mid-range series has already wowed the customers. The Bushnell Green Roof Trophy Binoculars is absolutely a delight to handle low light situations with bright images and super magnifications. Just like a large window letting more light into your patio the large lens will help you to get better images, and that’s the highlight of Bushnell 10×42. Also, the fully coated optical pathway makes another great plus of this super binocular model. And so light reflection that gets directed away is minimum and more light will be captured by the objective lens. The image quality is good with enough crispness to get the full understanding of the object you are trying to view. This binocular is meant for the hunters who need to have a check on their prey from far away. The magnification is 10x which is good for mid-range shooting or hunting. The binocular is entirely waterproof and also fog proof. And so you’ll be able to handle tough conditions well without losing sight of your prey. There is also fast focus included making sure you don’t miss your target. The soft thumb grip is comfortable and feels smooth. The glass is lead-free for better usability. Sometimes there are focus issues noticeable. The perfect way to see the beautiful planet we live in is through using a decent quality binocular. Being close to nature will feel better when you choose to pick the Nikon 7245 Action 10×50. This flexible binocular is a pro to offer great crispy view by illuminating you’re traveling cost. The most fantastic features that are noticeable in Nikon 7245 Action 10×50 are the ruggedness, wide objective lens, low light performance, and unparalleled strength it offers. The low light performance will help you greatly when you decide to use for bird hunting. The detailed picture without losing the correct color contrast is appreciable. With immense clarity and details in the picture, you also get enough ruggedness with shockproof abilities. This binocular is a great friend that will stay without wearing out too soon. The magnification it offers is up to 10x. So better and wider look at nature is within reach with Nikon 7245 Action 10×50. Also, the binocular is super versatile since it could be adapted with a tripod. So more scenic possibilities and viewing angles are available when you choose this binocular from Nikon. Overall, this binocular is budget-friendly and wide viewing tool that any adventurer would love to have. Better image quality and delivery. An excellent performer at low light. A bit heavy than usual. The Redfield Rebel 10x42mm is a great choice for binocular when you think about intense hunting, watching sport in the stadium or simply gazing at the night stars. 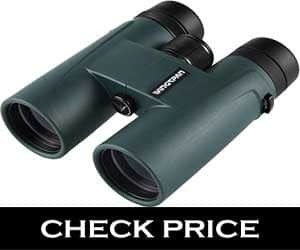 This top class binocular will be a fantastic choice to make with detail image and clear sight. With a quality built-in and amazing performance backup, the Redfield Rebel 10x42mm stands strong as one of the finest binocular under two hundred dollar range. The tight budget fanatics will love this go-to binocular that covers with 10x magnification. This makes practical efficacy for hunting too with great lens and optics. The multiple coatings are present in the lens to provide a crystal clear image. Also, it includes ergonomic BaK-4 rook prism design. There is also a twilight factor available to make sure the binocular performs well even in dim light. 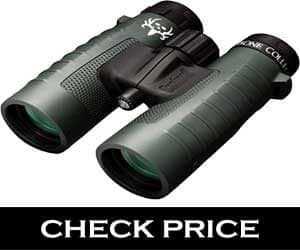 While the binocular can also be taken when going for deer hunting since it covers sub-250-yard distance. Wild-life observation will be so much better when you choose this model since it comes with 4.3 feet focus distance. The reduced weight, twist-up eyecups, travel-friendliness, and an optimum viewing experience makes it one of the best binocular in the budget range. The price point is very low. It is adaptable with a tripod. Other helpful accessories also included. Not suitable for close-range hunting. Bushnell with their great reliability and user-friendly tools have already won hearts of hunters, travelers, and sightseers. The L-series has a few binocs that are outstanding when it comes to quality with worth. The 10x42mm is different, and it is a great performer in sightseeing or even hunting. With only 2.2 pounds of weight, the binocular is super light to carry. This pineapple weight binocular is also a textbook size that makes usability very easy. The 10x42mm viewing makes more light enter the tool giving the user a clear image and brightness. Also, the tool is 100% water and fog proof. So avid hiker or walkers will love the moment with this binocular when it is slightly drizzling. Even if the weather is too nasty, you won’t have to stay at home being bored and dimmed. Also, the brand is well known for high-quality manufacturing schemes, and so they have won many awards. So undoubtedly there is no fear about sturdiness or durability. The ED prime glass is another huge plus of this binocular that can be excellent in low light conditions. Also, there is a great guarantee coming along that assures you would have the option to refund if the tool doesn’t meet your expectations. So it is a safe deal that will keep you covered for sure. Ed glass for better low light viewing. The eyecups and eye lens are slightly loose on certain occasions. Streamlined feel and high performance in binocular is what we usually look for. The wingspan optics brand always considers the customers’ thoughts. They introduced wingspan optics naturePro HD 8X42, a roof prism genius that is highly flexible and adaptable for any visible need. The waterproof design is a relief for folks who are craving for a decent binocular to take out while it’s raining. Also, the easy focusing is very smooth making it simple to gaze at an object clearly and fast. The rugged and reliable construction makes room for rough usage and still enjoying a durable performance. There are lenses inside that uses multiple coatings to ensure a better quality of light transmission. Also, razor-sharp clarity will always be at your rescue when you choose the naturePro HD 8X42. The armor is coated, and also the twist eyecups are very handy to use. Handling and carrying the tool is a piece of cake and there’s no complexity to make your trips irritating. At a low price being weather-proof binocular is an extraordinary thing. Making adjustments are compatibly easy. Also with complete coatings and such user-friendly design, this is definitely one of the best binocular under 200$ in the market. Affordable binocular with great capabilities. Better image clarity and resolution. Comfortable to carry and use. You need to try a few times to get used with the adjustments at first. Learning how to find the best hunting binoculars under $200 is a bit tricky. That’s because there are lots of things that you need to focus on right off the bat. We created a list with some of the most important features to consider, and you can find them here on our page right now. We believe that every unit you get needs to be durable. The reason is simple, you can knock on a tree or a rock with them by mistake and if they are not durable they will be gone. You want to avoid units that are very fragile. You are going to use these in the wilderness, so having fragile stuff like this is not going to work. You want durability, you want quality and you really have to push the boundaries as much as possible. Plus, you can easily use the best hunting binoculars under 200 for a variety of other tasks too, such as astronomy. These binoculars are very reliable and accurate, so it makes sense to have a very powerful unit. This way you will have no problem picking the best value and quality for the money, and the ROI will be amazing for you in the end. That depends on what type of hunting you want to do. Most of the time you want the best possible magnification you can get for the money. That’s because high magnification values help you see lots of things from afar. It definitely makes a lot of sense to use such a unit, and it’s up to you to identify the right options. Just remember that it can take a little bit to get comfortable with a product like this, so don’t rush and try to study every magnification option you can acquire. Then you will have no problem using the right one for you. 10X should be a good magnification, but if you can get something better than that it will help you immensely. You want a 40 mm or a 42 mm objective if you can. The larger your objective is, the more you can see in detail. But do keep in mind that the 50 mm objectives are very expensive, so at the best hunting binoculars under 200 dollar you will go for 40 or 42 mm. You still get plenty of value and an impressive set of visuals without having to worry that much about any issues or anything like that to begin with. Usually the field of view has to be very long. It’s important to have a field of view of at least 1000 yards. This will just make it easier for you to get a good experience, and it’s certainly the type of benefit that you really need from a unit like this. The exit pupil size is important, because this is what allows light to go through the eye. The idea is that you want a large exit pupil just to be safe. As for the relative brightness, you want to have an RBI higher or around 25, as this will end up giving you the utmost value and quality in most situations. The focus type is important, you will mostly find a center focus or an individual eyepiece focus. There are great results here when it comes to the long distance work and medium. IF binoculars don’t really need any focus at all, whereas the center focus units are good if your game is closer than 30 yards most of the time. So you can use the IF binoculars for large distances and the others for something a little bit smaller, depending on the situation. You want an eye relief of around 14-20 mm in case you wear sunglasses or eyeglasses. Most of the time this is a crucial option to consider for most people, even if you don’t wear sunglasses you still want a proper eye relief just to be safe. So yes, you do need to consider the use of a good eye relief, as it will be well-worth the effort for the most part. This mostly comes down to the lens quality and what type of lens you are using tat this time. Ideally you want the best possible lens types out there. Nikon, Leica and Zeiss provide good lenses, so you do want to give that a shot if you can, as it will be well-worth the effort. You do want to avoid things like eye fatigue especially if you want to use the binoculars for a longer period of time. The coating is great if you want to remove things such as light reflection. If you try and shoot in direct sunlight, you will notice that there will be issues as you can’t really focus on your target as much as you would like to. So it makes sense to use the right type of coating for this sort of thing. It does take a while to find a good coating, but in the end results will be very good and that’s the most important thing. Ideally you want a multi-coated or fully-coated unit, just to be safe. Usually you want multi-layer coating as this is amazing in regards to light reduction. Single coating units are still ok, but if you can go with multiple layers you should totally do that, just to be safe. It might be obvious, but the best hunting binoculars under 200 dollars should be quite light. The last thing you want is a pair of binoculars that’s heavy and very hard to wear. We encourage you to take your time as you find the right unit here and the ROI will be great if you pick the right unit. You will definitely be more than happy with the experience and results in the end. Yes, since you will be outside for a long time, you might have to deal with the elements, so that’s why you have to consider things like waterproofing. It’s extremely important to think about waterproofing, as you will protect your unit and it will last for a longer period of time. That’s why you need to take your time and study the market for a unit that has waterproofing. You won’t really see the need for such a unit until you encounter lots of rain during your hunting trips. So you might as well prepare for this beforehand. Accessories are important. Some of the best hunting binoculars under 200 dollars will not have accessories in order to put most of the costs towards better lenses and stuff like that. Which is why it makes a lot of sense to always focus on value and quality more than anything else. But if you need accessories within this price range, there are plenty of models to consider that may do the job really well for you. The idea is to identify what you need and once you have that you focus on results and quality. Will the best hunting binoculars under 200$ make you go overbudget with accessories and stuff? Are you getting the ultimate value for your money with this? All the little details matter when it comes to stuff like this, and that’s why you need to figure out if your budget is good or not for something like this. It will definitely be a great experience and a wonderful way to enjoy your time the way you want. If you want, you can go overboard with the costs a little bit. That’s because opting for high quality models will always come in handy and it will give you resounding benefits all the time. It works amazingly well and you will love the results all the time for sure. Just try to give that a shot and the experience will shine. It’s great to have support and plenty of value, and it all comes down to you to make the right pick. Yes, this matters a lot even if you might overlook it for a lower price. If you purchase binoculars made in Asian countries you will have a lower price, but that comes at a cost, since the build quality is not as good. So the best thing that you can do at this point is to make sure that you purchase something made in the US. However, if the overall build quality is less important than the price, usually Asian-made models are the right ones for you. All these things will be quite nice and they will bring in front some rewarding benefits all the time. It’s a wonderful system to consider if you want to get some good binoculars ready to go. Is it worth it to get the highest magnification? 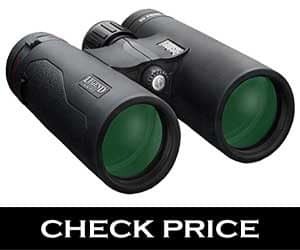 Considering the fact that you want the best hunting binoculars under $200, you need to sacrifice some things due to the price point. You don’t need the highest possible magnification. Sure, it will work great most of the time, but the crucial thing is to focus on results and on finding the right approach. It will be a stellar experience and you will enjoy the outcome a lot. Do you really need waterproofing? That comes down to where you go hunting. If you live in an area where it rains a lot or if you hunt for many hours during the summer, waterproofing is important. But if you don’t really have lots of rain in your area, it makes sense to ditch waterproofing just to save money. And it will still be worth it in the end. Should you get multi-layer optical coating? Yes, it does work great for you most of the time if you opt for something like this. The idea is to make sure that you always tackle this with the utmost confidence and focus. It will work quite nicely if you go for the multiple layers, although if you lack the money the single layers are just as good most of the time! There are other models available as well except these five. But I tried to sum up a list that will be helpful for folks who are on a budget just like me a few years ago. So you see, there are quite a few options when thinking about the best hunting binoculars under $200. But no matter what you choose always remember you would be paying money, even if the amount is less. So gather some time, do your research and know in details. If possible, make a list of requirements you are going to need. Are you a seasonal hunter or maybe just a sightseer who likes traveling with a mini binocular? If so, then getting the most basic binocular will be enough. A good quality binocular will be a great help to have a look at this beautiful world more intensely. Good Luck! Clevershooter.com is a participant in the Amazon Services LLC Associates Program, an affiliate advertising program designed to provide a means for sites to earn advertising fees by advertising and linking to amazon.com. Amazon, the Amazon logo, AmazonSupply, and the AmazonSupply logo are trademarks of Amazon.com, Inc. or its affiliates. As an Amazon Associate we earn affiliate commissions from qualifying purchases.